'Grand Canyon Suite' In 1916, an itinerant pianist in his 20s strapped gas cans to a vintage jeep and drove across the Arizona desert to watch the sun rise over the Grand Canyon, and it inspired this music. In 1916, an itinerant pianist in his 20s strapped gas cans to a vintage jeep and drove across the Arizona desert to watch the sun rise over the Grand Canyon. More than 40 years later, Ferde Grofe described what he saw in a radio interview. "I first saw the dawn because we got there the night before and camped. I was spellbound in the silence, you know, because as it got lighter and brighter then you could hear the birds chirping and nature coming to life. All of a sudden, bingo! There it was, the sun. I couldn't hardly describe it in words because words would be inadequate." So Grofe used music, the language he knew best. Ferde Grofe knew how to use every instrument in the orchestra to bring his compositions to life. In the "Grand Canyon Suite," he evoked the natural sounds he'd heard on his visit there. He made the woodwinds sound like birds and the trumpets sound like crickets. When instruments couldn't mimic real life, Grofe found ways to incorporate the actual sounds into his music. Conductor Gerard Schwartz--whose Seattle Symphony recorded "Grand Canyon Suite" in 1991--says Grofe may not have been the first to use sound effects, but he was one of the most original. "He uses a lot of percussion devices, you know, even the famous coconut shells to make it sound like the burro making its way around the mountains. And I guess the most interesting of all is in the "Cloudburst" movement, where he uses the rumblings of the wind machine, the thunder sheet. It's not to say that wind machines weren't used. I mean, Ravel used the wind machine in "Daphnis et Chloe." Thunder sheets had been used, and continue to be used to this day. But he did it in a very individualistic way. And I guess what we tend to reward in life is innovation as well as creativity. And Grofe was certainly a remarkable innovator, especially in terms of the orchestration. Ferdinand Rudolf von Grofe was born in New York City and raised in Los Angeles. He came from a family of fiddlers, mostly from Germany. At age 13, Grofe quit school and worked odd jobs as a bookbinder, a theater usher and a horse driver. In his spare time, he liked to hunt in the desert and write music. He began playing second-chair viola with the Los Angeles Philharmonic. In the off-season, he took a job that provided him with a completely different musical experience, according to his son, Ferde Grofe Jr.
"He was playing piano in bawdy houses, brothels, as a matter of fact, in San Francisco when he was 16 years old where he wasn't supposed to know what was going on upstairs in the second floor. And that was when he actually first heard jazz. Ferde Grofe began doing what few, if any, had tried. He started writing down what he heard and coming up with original jazz arrangements. Grofe's talent was noted by the popular dance band leader Paul Whiteman, who was himself experimenting with a small symphonic jazz orchestra. Grofe joined his band as a pianist and violinist in 1917. He eventually became the band's orchestrator, a job that gave him great visibility in 1924 when Whiteman commissioned a work from the brash George Gershwin. 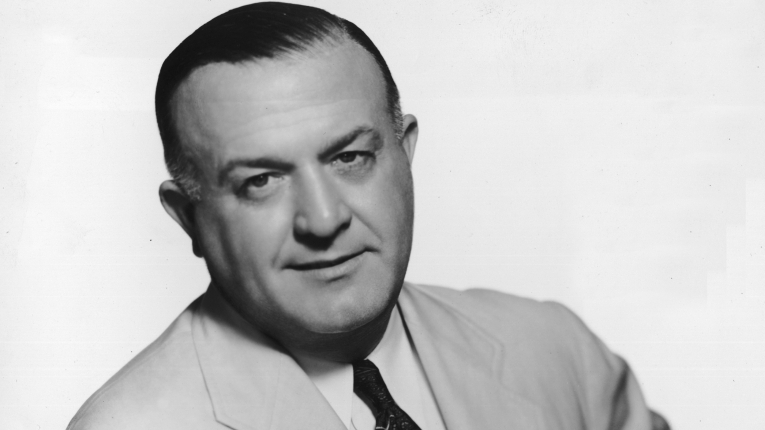 When the time came to adapt Gershwin's dance band version of "Rhapsody in Blue" to symphony orchestra size, it was Ferde Grofe who did the job. According to Ferde Grofe Jr., it was this experience that lit a fire under the orchestrator to create his own work. So he picked up the piece he'd started a few years earlier inspired by his trip to the Grand Canyon. Grofe divided the work into five sections: "Sunrise," the "Painted Desert," "On the Trail," "Sunset" and "Cloudburst." The last movement he conceived during his honeymoon in Minnesota. Apparently, he was caught in an outhouse when a storm hit. His son says he played a personal role in creating the famous rhythmic figure for the "On the Trail" movement. When Grofe Jr. was a year old, his father was looking for a way to depict a man on horseback or mule. "My father was wheeling me around in a baby carriage. And across the street from the apartment, there were some pile drivers putting in pilings for a building. And that makes that `thunk, clunk, thunk, thunk, thunk,' you know, type of sound. My baby buggy had a squeak in it. And the squeak went `squeak, squeak, squeak, squeak, squeak.' And out of that came 'On the Trail.'" Ferde Grofe completed the "Grand Canyon Suite" in 1931. At first, he wrote it for a small orchestra, around 20 players. But when he expanded it for a large symphony, Gerard Schwartz says that's when the work came alive. "Then it became very much more pictorial, very descriptive and with elements of jazz. But really, it was just brilliant orchestration, not so different from what Rimsky-Korsakov would do in a Russian style. But he did it in an American style and in a 20th-century style." Ferde Grofe is sometimes referred to as America's tone poem composer. He was a sentimentalist. His favorite composer was Tchaikovsky. His son says Grofe saw a wide range of emotional possibilities in the "Grand Canyon." "'Sunrise,' birth; 'Painted Desert,' the mystique, the unknown, the divine unknown, if you like; 'On the Trail,' the human comedy; 'Sunset,' death. And then 'Cloudburst' is death and resurrection, the battle of good and evil. And I think that's why most people find it so important, because they can identify some emotion in themselves in his work." Pictorial orchestration is sometimes overlooked when we consider the merits of musical compositions. Ferde Grofe's "Grand Canyon Suite," with its almost non-stop musical effects, communicates an infectious passion for the beauty of the untouched American West. It's become an international postcard, and many of its tunes have entered popular culture. And it's got a happy ending. At the end of the violent "Cloudburst" movement, Grofe leave us with two sections that he called "Moon Comes From Behind the Clouds" and "Nature Rejoices In All Its Grandeur."